it is. the patina’d version. I’ve done 2 things that feel different to normal behaviour today… I’ve become a flipper, and a Rolex owner. Flipped the seamaster and now have a subC. Gulp. Great work. SubC is the best sub. Very jealous! Pre-owned. From my usual’little gem’ dealer. He doesn’t usually do much at this sort of value…. Location, shop size etc…. It’s easier for him to shift 10 £5-600 watches then one £5-6k watch. He does get some though and has some regular customers with some that they will flip occasionally. He knew I was interested in a sub/GMT and texted me when he got 2 in. I was only minutes from the shop anyway, on the way there about the seamaster as it was back from service. One sub was 2006, had a hard life, a less then great polish still dinked but priced at £4700. I was interested in the other, 2015 unworn at £6k . Flipped the seamaster back getting sightly more than I paid even after the service. The SubC… Embarrassingly…. Will remain a safe Queen for the moment. Waiting for the big birthday in a few years. Thats awesome. Sounds like a grade flip/trade tbh. £6k is a good price too, just a shave over current retail. Screw the safe, get it on the wrist. And post photos. I’m at Heathrow in a about 5 weeks time, wish me luck for the boutique there…. I read Schiphol can be good fishing, Heathrow….hmm. Yes, fairly sure I could get my cash back on the watch pretty easily. Obviously watch finder selling prices are way above what I could liquidate for, but they have 18 month old ones for 7900-8250. Down at the shallow end of the spend spectrum, has anyone else been dabbling with any of the JOMW reviewed chinese specials? 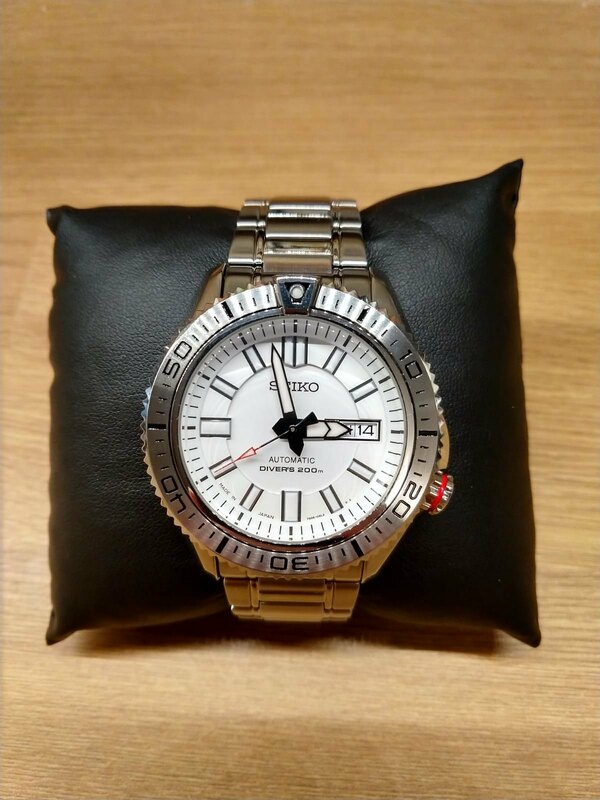 Allegedly a seiko mechaquartz movement (I’ve not opened it yet) what appears to be a stainless case with a stupid big Scratch magnet of a crystal that’s been well coated in AR and looks quite nice in sunlight. For what Aliexpress have had from me I could have bought a basic SNK but where’s the fun in that? I nearly hit a buy on the meca-quartz Jody reviewed. Pics mate? Looks lush. 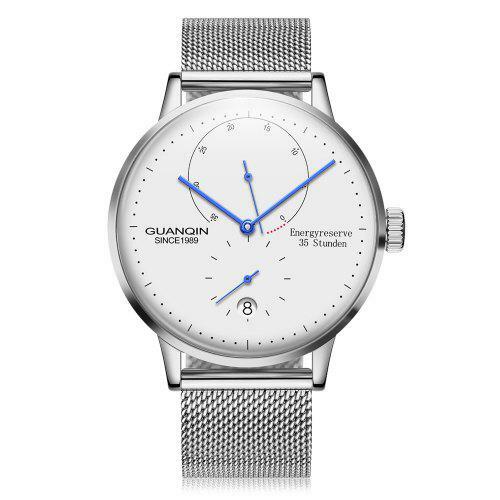 Was gonna get that and the white / blue guanqin nomos lambda wannabe too. Both are great looking. Looks OK in the relatively dingey afternoon light, chronograph functions OK. Going to change the bracelet for a light brown leather strap, should suit it better I think. Thing is for under £30 it is a bit of silly fun. Yeah I’m blessed with skinny wrists too. I don’t think it would be so bad if the lugs had some curve to them but as you say, 30 quid it’s not all that bad. There’s a Chinese “Mocktail” too. The more I look at this the more I want one….Especially on the faux shark strap. 2 watches for under 70 quid delivered is super tempting. Jody is pretty keen on cadisen watches, mainly because they come with sapphire, but they are generally a shade more than I’d really want to spend on a Chinese watch. Nah that Starking does nowt for me. But blue hands white face…. So this. 44mm will wear big on any wrist and a watch like that, all dial, will always be visually…..’impactful’ ! That’s just a crappy Nomos Lambda copy. ‘Homage’ watches are just one step away from fakes. 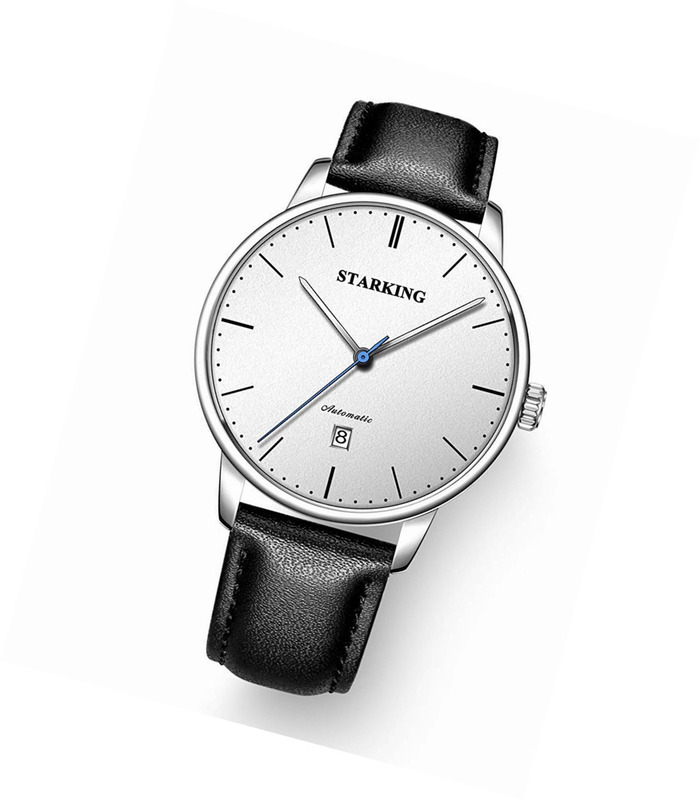 I agree it’s not an exciting watch to look at and theres a saphire glazed version for ~£40, but I don’t mind the clean dial layout, and really want to see how the supposedly high-beat movement works out. This will sure spark some debate..! Never thought I’d say that about a TAG watch! I thought the same about those Tag Autavia watches, they look lovely. I said I’d not buy another Tag, those may well chance my mind. agreed, read that hodinkee article last night and liked many of the autavia, the bronze ones very much. crowns do look ‘kin huge though. Yes, crowns sticking out like that are a no no for me. Black bay have similar silly long crowns. Proper watches have asymmetric sides to hide the crown in a slight protrusion of case. Big crowns on a manual fighter pilot with gloves on is a true replica. Otherwise, no. Ok I’ll take a bite on that homage topic. Damn, I’ve put a noticeable scratch on my watch case. Polished stainless steel, can anyone recommend the best way to improve it, if not entirely remove it. I’ve not got a Dremmel or anything. Cheers. Ever since i saw that c60 I’ve been craving after a Steinhart Ocean 1 Bronze Red… oooof. I’ve not got a Dremmel or anything. Cheers. Now you have all the excuse you need to go buy one! Everyone needs a Dremmel, and they’re not that expensive. Zelos do some nice bronze watches. Just make sure the case back is stainless unless you want a green wrist. lol. sort of…but more like buying a pair dirty jeans. its patina, its not wear. I’ve recently acquired my first mechanical watch, a Seiko SKZ323. I was pretty pleased with it. It wears a bit smaller than the nominal diameter, has a nice weight & a white faced diver is desirable to me but not a common configuration I don’t think. This was until I realised it was losing ~45s a day and then noticed a tiny amount of condensation inside. Sad face. I guess it’s in need of a service & seal overhaul. The movement is a 7S36, so not posh. Quotes I’ve had in are all ~£200+ or ~80% of the purchase price. This is disappointing. Can anyone reccommend somewhere to send it? Or is seal replacement on the caseback and timing adjustment something a keen amateur can attempt? get it open asap to dry out. it’ll need a service as well as new seals, hopefully you’ll find someone for less than £200 though. I love a watch thread. Have a Christopher ward trident a couple of siekos and my dads Raymond weil. Turned 50 last year and have some money to buy a nice watch but can’t make my mind up. Like the Tudor pelagos and black bay or an omega seamaster. We’re of to lanzarote in a few weeks and was wondering about the tax free status as there’s an ad there. re: the Nomos Lambda comment…. Honestly, how many people would know it was a fake, copy, homage or original. I like the Lambda. I’d hit the Guanqin. A fake is a copy, like for like. A homage is a hat-doff to the original. A fist bump or a high 5. I’m easy with that. More easy than explaining to the wife I bought a $20,000 watch anyway! grm, I’ve read that customs are pretty hot on people walking back through the airport from places like the canary islands.